For students with dyslexia, work that requires reading and writing can be daunting, and it often saps the enjoyment out of school. Fortunately, more and more families and schools are discovering assistive technology (AT) and the ability it has to lessen stress and give children a greater sense of academic independence. While many schools have folded technology into the classroom, students are also increasingly using their own smartphones and tablets. The built-in accessibility features (e.g., text-to-speech, dictation, word prediction) of mobile operating systems have made those devices extremely useful for dyslexic students, and the variety of AT-related apps flooding Apple’s App Store and Google’s Play Store raise the level of assistance to an even higher level. Since reading is a portal to knowledge, students with dyslexia can be frustrated that difficulties decoding and understanding written words often get in the way of learning. Apps that read text aloud, especially those that highlight words as they go, can take decoding out of the equation and make reading a more pleasant and more productive experience. There are also apps that can read PDF documents aloud, apps that convert pictures of text to readable text through optical character recognition (OCR), and specialty apps that read text aloud using recorded human voices. Since PDF files are essentially images of documents, they present a problem for basic text-to-speech technology. ClaroPDF is an app that can recognize image text and read it aloud with synchronized highlighting. Unlike most OCR apps, it preserves the formatting of the original document. At its core, ClaroSpeak functions as a basic text-to-speech app, in which the user can change its speaking voice and adjust its reading speed. What makes it stand out are its ability to perform OCR on photos of text and its ability to save a text document as an audio file for listening on the go. This is a great e-book app for Android devices because it integrates with the operating system’s TalkBack accessibility feature in order to provide continuous text-to-speech with synchronized highlighting. It should be noted that Google Play Books is also available for iOS devices, but that version lacks the “Read Aloud” feature present in the Android app. Yes, the price is high for a mobile app, but you will not find a faster OCR tool than KNFB Reader. Once the user takes a photo of text, the app almost instantaneously starts reading it aloud. This tool also makes it easy to collect photos of multi-page documents. Learning Ally is an economical source for human-narrated audiobooks. After purchasing an annual membership, users with dyslexia (or vision impairments) can use the mobile app to access and listen to books in Learning Ally’s vast collection. NaturalReader is similar to ClaroSpeak in its basic text-to-speech functioning. Text can be imported from other apps or placed directly into a blank document. The app also features auto-scrolling for longer documents. In addition, it has its own Internet browser that extracts just the text from Web pages for easier reading. An essential tool for all students with dyslexia is a good OCR app. OCR Instantly allows Android users to utilize the cameras on their mobile devices as portable scanners. 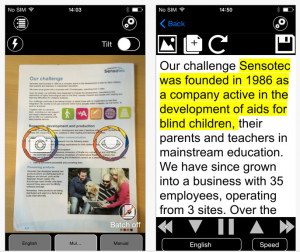 The app quickly converts photos of text into text that can be read aloud with text-to-speech technology. People who get their news from the Internet have been using Pocket for several years. Recent updates to the iOS and Android apps have made the curation tool a valuable piece of assistive technology. Students with dyslexia can collect articles in Pocket and use its new text-to-speech feature to hear the content read aloud. Prizmo is a full-featured and accurate OCR app that has an attractive interface and is easy to use. Converted documents can be edited in a variety of ways, can be translated to different languages, and are collected on a visual bookshelf. They can be exported as either text or PDF documents and quickly opened in other apps. The integrated text-to-speech features speed control and synchronized highlighting. Shakespeare is alive and well in many schools, but the Elizabethan language of his plays can pose a major problem for students with dyslexia. The handful of plays available from Shakespeare in Bits (including “Romeo and Juliet,” “Hamlet,” and “A Midsummer Night’s Dream”) make the stories accessible by presenting them in a multisensory format. Text-to-speech is combined with scene animations, and students have the option to translate outdated words and phrases to modern English. The Talk app is a basic text-to-speech tool for students who use Android devices. It can read a variety of text, such as website articles, stories from news apps, and copy-and-pasted email messages. 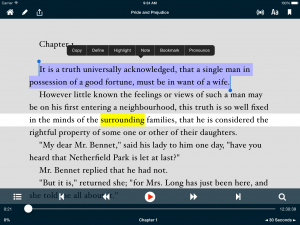 On iOS devices, a good option for reading e-books is the vBookz app. Books can be download from email attachments, Dropbox, and Google Drive, as well as from the app’s collection of free, open-source titles. The synchronized highlighting feature includes the option of using a unique magnifying glass instead of a traditional colored marker. Like ClaroPDF, the vBookz PDF app recognizes text from images and reads it aloud with synchronized highlighting. Original document formatting is maintained, but iOS users have the option of separating text from any accompanying images. Voice Dream Reader has become a favorite reading app for iOS users, and the Android version is currently in beta testing. It contains multiple visual and auditory options that make the reading experience completely customizable for each user. In addition to having the ability to read text from other apps, Voice Dream can also be synced with Bookshare, Dropbox, Google Drive, and Project Gutenberg. It has its own Web browser that can extract just the text from other distracting material found on many Web pages. Writing can be challenging for anyone, but it can be extraordinarily problematic for students with dyslexia. Written expression can be hampered by difficulties with spelling, applying correct grammar, and remembering desired words. For mobile devices, there are apps that utilize word prediction, dictation, contextual spelling and grammar checking, and word retrieval tools to make the writing process easier. One of the best tools to use for spelling assistance is word prediction. Co:Writer lets students practice their knowledge of phonics while providing an important accommodation. The app’s keyboard predicts the word a user is trying to write after only a few characters are typed. It bases its predictions on the context of particular sentences and on how well students sound out words they cannot spell correctly. Sometimes, traditional spell-checkers do not catch every error in a piece of writing, such as when students use incorrect homonyms. Ginger Page is a word processing app with a contextual spelling and grammar checker. It looks at entire sentences as units while searching for errors. It also has a unique rephrasing tool that suggests better word choices for a piece of writing. The onscreen keyboard of a mobile device is essential in the transformation of thoughts to written words. For Android users with dyslexia, the Google Keyboard provides both dictation and word prediction for spelling assistance in any app. 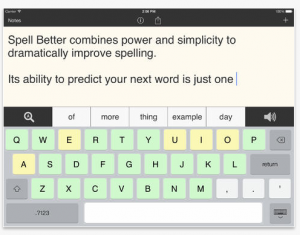 Like Co:Writer, the iWordQ app provides solid word prediction for help with spelling. Its most unique feature is that it provides usage examples for easily confused words and homonyms. It also provides a greater number of predictions than other apps — with up to nine choices accompanying each word. Keeble is a third-party onscreen keyboard that provides advanced word prediction with auditory feedback for iPad users. Notably, Keeble’s word prediction is self-learning and becomes more accurate over time based on an individual’s vocabulary. It can also be set for word completion, next-word prediction, or multi-word prediction, depending on a student’s writing skills. Workbooks and photocopied worksheets can be problematic for students with dyslexia. During normal OCR, the formatting is often lost for fill-in-the-blank and matching exercises, a problem that makes it difficult to use AT to insert answers. SnapType solves that problem by giving users the ability to overlay text boxes on photos of worksheets. Students can then use a keyboard to place their responses in the correct spaces. Like other iOS word prediction tools, Spell Better acts as a basic word processor that provides spelling support by suggesting words as characters are typed. It has two unique features, however, that are worth noting. First, if students tap and hold a selection in the word prediction bar, the app will provide the pronunciation and dictionary definition. Second, students can have all of the word prediction choices read out loud in the order they appear before making a selection. The Voice Dream Writer app is a writing tool that has a handful of unique features not found in other word processors. In addition to multiple options for auditory feedback as students are typing, the app allows for visual customization, including the ability to adjust spacing between characters. It also has a unique set of reference tools. Students who have difficulty recalling specific words can look these up by definition, and they can also look up words using phonetic spellings. Taking effective notes in class is important for both retention of new knowledge and preparation for quizzes and tests. The most effective notes for students with dyslexia (and indeed, for all students) are multisensory in nature and often contain images and audio notes in addition to text. There are several apps that make it easier to generate multisensory notes, along with apps that can be used to create multisensory electronic flashcards that promote effective, independent study. Electronic flashcards have several advantages over traditional ones created with index cards. The biggest advantage for students with dyslexia is that they can use text-to-speech technology to study their cards independently. Flashcards Deluxe is perhaps the most full-featured flashcard app available. It has integrated text-to-speech, the ability to create more than two sides for each card, the ability add images to all sides, and multiple visual options for customization. Mental Note is a full-featured note-taking app for Apple devices that allows students to create customized, multisensory notes. In addition to typing or dictating text, students can add voice notes, sketches, and photos. Notability is another option for multisensory note-taking. It is packed with features and options, including rich-text formatting, audio recording, sketching, and highlighting. In addition, students can add multiple forms of media, including photos, Web clips, and sticky notes. Completed notes can be exported to Dropbox and Google Drive and opened in other apps. A third full-featured note-taking app is PaperPort Notes. It allows students to input and highlight text, draw diagrams, add audio recordings, and insert images from the photo app or the built-in Web browser. A standout feature is that it has OCR capabilities that give students the option of inserting editable text from photos of text. 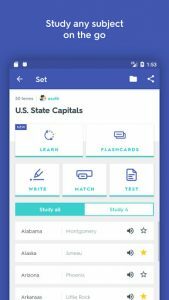 Students familiar with the Web-based flashcard tool Quizlet will find its companion mobile app beneficial. Flashcard decks created on the website can be downloaded to mobile devices, and students can create new multisensory decks directly in the app. All decks utilize integrated text-to-speech for independent study and auditory reinforcement. There are a handful of apps that perform multiple functions and can be used for various purposes. They include multisensory presentation apps, electronic graphic organizers, and tools that help with both reading and writing. Because they are typically more robust than the more common single-purpose apps, they can be particularly useful for students who rely on mobile devices to complete their schoolwork. Adobe Voice provides an elegant alternative to traditional slideshow presentations for students with dyslexia. While the app gives the option of including written text, each presentation is based on voice narration and images. Once a series of slides is created, the app transforms it into an animated video with background music. There are many uses for electronic graphic organizers, and their multisensory nature makes them ideal learning tools for students with dyslexia. Inspiration Maps makes the writing process easier and more efficient. It can also help students improve their reading comprehension and study skills. It easily converts visual diagrams to linear outlines, and the app contains many formatting options that allow users to customize their work. Kidspiration Maps targets elementary-aged students. It shares most of the features and functionality of Inspiration Maps, but it is more visually pleasing to younger eyes. It also adds a few unique features, such as several subject-specific activity templates. 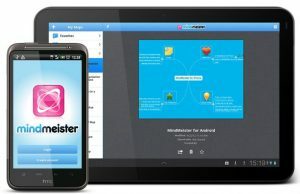 A second option for creating electronic graphic organizers for both iOS and Android devices is the Mindmeister app. It has multiple visual options for creating customized diagrams, which can be exported as PDF, PNG, and RTF files, as well as converted to Word and PowerPoint documents. One of the best third-party onscreen keyboards available for mobile devices, Read&Write provides multiple reading and spelling supports for students with dyslexia. It has integrated text-to-speech with synchronized highlighting, as well as a built-in dictionary and picture dictionary to help with reading comprehension. 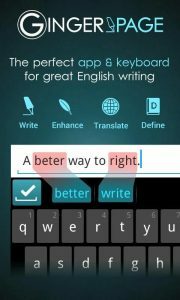 It also has word prediction with auditory feedback and an integrated spell-checker to help students compose text in any app. In addition, the iOS version has a text-to-speech tool that integrates with the Safari app for use with Web-based material. It is unlikely that any particular student will have a need for every app on this list. Since each instance of dyslexia is different, individual students will need unique sets of apps to accommodate their own language difficulties. The great thing about using smartphones and tablets as assistive technology is that they are customizable learning tools, and they give all students the ability to find out what works best for them.